With spring here and thunderstorms in the forecast, I thought I would review the Lightning Strike Pro, a lightning shutter trigger from AEO Photo which has been kindly provided by B&H – the largest photo reseller in the world that we use more than any other to buy our photography gear. The AEO Photo Lightning Strike Pro makes capturing a photo with lightning easy – and potentially safer. Without a lightning strike trigger, one would either utilize a long exposure and hope that you capture the moment or you would have to hope your shutter finger is fast enough to react to the first millisecond of flash. Now, there is an easier and better way to capture lightning strikes with your camera. It is so easy in fact, that the first time I tried to use it, I set it up on my backyard deck, and since the sporadic lightning occurring was more of a flash in the clouds as opposed to a bolt, I left the set-up on the tripod and did a few minor chores around the house. After about 10 or 15 minutes, I came back to check the pictures. What I found was that amongst a number of shots of a cloudy but lit up sky, was one shot that included a lightning bolt. Kind of like those commercials on television, you can set it and forget it, it is that easy. Not only easy, but it is also safer than standing outside exposed to the elements while trying to grab a photo. AEO Photo manufactures 3 different models, a basic model the Lightning Strike!, the Lightning Strike Pro that adds sensitivity adjustment to give the user some flexibility and more control and finally, the Lightning Strike! MT which adds a motion sensor to the trigger for wildlife photography. Let’s take a closer look at the middle model, the AEO Lightning Strike Pro. The Lightning Strike Pro is simple and straightforward to use and mounts to your camera’s hot shoe and communicates to the camera by a cable. In the case of the Nikon D300, it connects via a 10-pin cable. The design of the Lightning Strike Pro will allow you to buy cables to suit your needs so that should you change camera models or if you have multiple cameras, you need not replace the entire unit, just the relatively inexpensive cable to fit the appropriate camera. 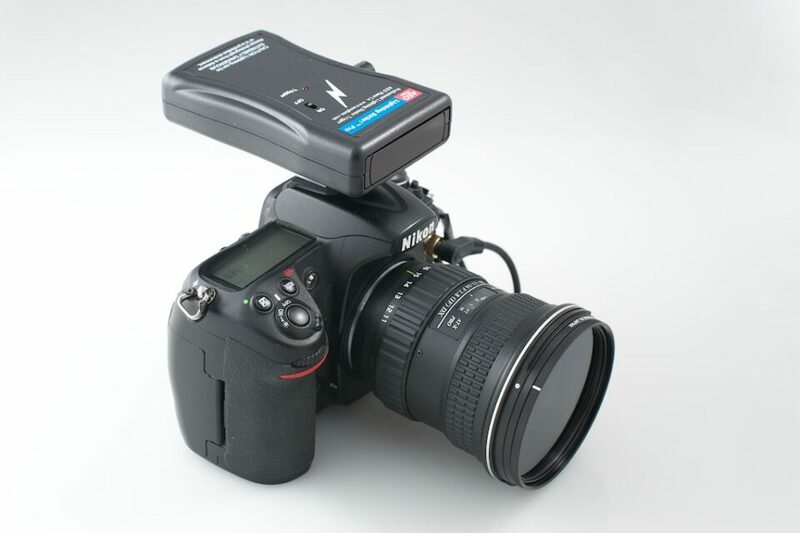 The sensor is placed on the hot shoe with the sensor facing forward and the cable attached to the unit and the camera. It is best to shoot in manual mode and I found shooting from f/5 for 4 seconds to f/7 for 5 seconds was an acceptable range at night. You should set your ISO as low as possible and if your camera has a Long Exposure Noise reduction setting, then adjust it accordingly. Set your camera to manual focus and set the focus to infinity. Double check ahead of time that your lens is actually focused on infinity when it says it is as it could be slightly off. You then turn on the switch at the top of the sensor, one frame will fire and then you are set to watch the show. Should you find that you need to adjust the sensitivity of the trigger, there is an adjustment screw on the side of the unit. I found that my unit worked excellent with no adjustments needed in daylight, dusk or night scenes, but should you need it, it is there. The trigger will fire in the first 0.1 milliseconds of the lightning flash and will activate the shutter. Of course your camera will snap the photo immediately, depending on your camera’s normal lag. Overall, this unit worked excellent out of the box, it consistently triggered only when it was supposed to. I did have a brief period in which it did not fire correctly, but I believe that when I moved locations, the cable connection came loose. The unit worked again flawlessly after that. 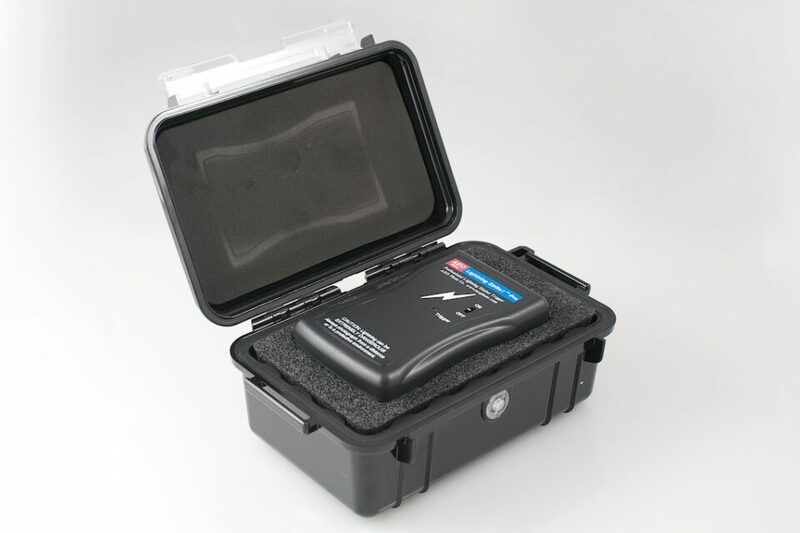 The Lightning Strike Pro comes packaged in a Micro Pelican Case that is custom fit with foam to cradle the unit and its cord beautifully. In fact, all photo equipment manufacturers would do well to provide protective packaging as nice. The only negative to it, is that for the space challenged equipment bag, it might take a bit more room than one would like. I can see many photographers taking it out of the plastic case and just putting it in an equipment bag to save space. A nice touch would be an additional small, lightly padded pouch (think neoprene) that protects without taking up as much space. As for the manual, well there is good news and bad news. First, the good news, the trigger is extremely easy to operate and so a lot of operational instruction is not needed. The bad news is that there isn’t much in the way of a manual, it is just a single sheet of paper with straightforward instructions and a few tips. While this is adequate, maybe a little more information would be helpful in case someone is trying to troubleshoot. The AEO Lightning Strike Pro Trigger is well built, it is plastic, but all the parts seem to fit well and be constructed nicely. The on/off switch seemed small to me at first but there is a method to the manufacturer’s madness. In an earlier version, the switch was larger and although it was easy to find and use, that ease of use made it easy to be accidently turned on while in a camera bag, thus resulting in drained batteries. AEO Photo has since redesigned the switch to minimize the chances of this happening. The Lightning Strike Pro Trigger is light so weight is not a problem. As for the size, it has a low profile when seated on the hot shoe. However, it does hang off the back of the camera rendering the viewfinder difficult to use as your forehead and the back of the unit battle for the same space. Luckily, you do not need to use the viewfinder much because you will likely have this mounted on a tripod with the camera set to fire. The only time you need the viewfinder is to recompose as the storm moves. First off, anything that increases your safety has a value. As for value relative to similar products on the market, I compared the cost of the AEO Lightning Strike Pro with others and found it less expensive making it a good value considering it does what it claims. It goes without saying, lightning is a deadly beauty and so in your excitement to capture an interesting scene, PLEASE DON”T FORGET TO BE SAFE! Position yourself a safe distance from the strikes and pay attention to surroundings that might attract a strike and avoid unsafe areas. Here is more information on lightning and safety tips. At the time of this review (May 2012) AEO Photo has just announced new 3rd versions of their triggers which will have improvements, chief among them, a reduction in size. I found the Lightning Pro Strike Sensor to work as advertised, it was both accurate and reliable and allowed me to shoot from the relative safety of a car or building. It isn’t as cheap as just repeatedly pressing the shutter with long shutter speeds but it is just as fun and prevents taking scores of frames with no lightning in them. My only regret is that I didn’t have more storms to take photos of before this review. So if adding some lightning shots to your landscapes interests you, consider adding a Lightning Strike Pro trigger to your camera bag. Have fun and be safe! Woo hooo!!!! Very cool beans!!!!!! The biggest problem I had while shooting lighting strikes (with long exposures) was to guess where it would hit next. To be sure, I could zoom out, but I don’t get much detail in the strikes. If I zoom in, it’s really frustrating to see a huge clear strike right outside of the frame. It’s actually the only kind of picture with group shots where I could use a D800. David, thank you for your comments. I have not used the trigger that you refer to so I can’t comment on it from first hand knowledge but it seems that it works well for you. From their website, it appears to have a similar design except that the unit sits higher (higher profile) but I can’t tell how far back it sets from the hot shoe. It would be nice to do a side by side comparison. The unit you use is more expensive and doesn’t appear (at least on quick review of the website) to have the a sensitivity adjustment control. Otherwise, appears very similar. Thanks again for reading and for sharing. It sits far enough forward — as far forward as a typical flash unit would — that I am comfortably able to look through the viewfinder with it attached. You are correct — there is no sensitivity adjustment control on the unit but I’ve never needed it. It is more expensive. On the other hand, I ordered it directly from the developer and we’ve emailed each other a couple of times and discussed the device. That’s a nice touch. Is it worth the extra cost? For me — yes. Thanks for the update and the feedback, David. You are right, customer service is always of value. Thanks again. First thought was; “I wonder if it would or could be made to, work with fireworks. ?” Then decided probably not as would fire when they were first opening rather than somehow catching the true burst? I’ve had pretty good luck catching fireworks! Ralph, the unit looks nice, the display is nice and has more functionality. The only thing that caught my eye is that the response or lag time was “in milliseconds”. The reported response time on the reviewed product and others is 0.1 milliseconds. If the nero trigger is not as fast, it might make a difference. Otherwise, looks promising. Tom, isn’t the shutter lag of our Nikons about 42ms by comparison? Regardless it’d be great to hear someone else’s experiences before ponying up for one. Since I sold my D3X and D3s and am whiling away my time waiting for a D4/D800E while over-working my day job, someone else has plenty of time to be first. Ralph, you are correct, a D3s is 0.43ms. Obviously, whatever the shutter lag is, this lag is in addition to the 0.1 ms lag of the trigger, not concurrent. I am sure that your point is that it is minimal whether it is 0.1ms or 2 ms. Enjoy your wait for the D4/D800E – that is a sweet combo and I am sure you will enjoy them both. Thanks for the comments. Will this work with Nikon D3100?